How do you create perfect family beach vacations? Choose Virginia Beach. No matter what your age or interests, you can create perfect family beach vacations here. That's because the Virginia Beach area lives up to its motto "all kinds of fun!" 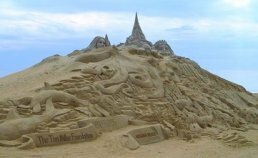 The World's Tallest Sandcastle at a Virginia Beach Neptune Festival. With 35 miles of wide, sandy coastline to choose from, you'll find just the right place to plant your beach blanket. Quiet beaches -- Looking for a quiet beach where all you hear is the wind blowing through your hair? The rhythmic roar of the waves lulling you to relax?... it's here at Back Bay National Wildlife Refuge (find the details by clicking on the "Attractions" button on the left). 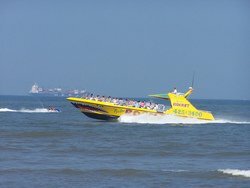 Adventure beaches -- the Virginia Beach boardwalk... parasailing...roller blading...waterslides... fishing...concerts and festivals...fantastic restaurants...if you want non-stop excitement and adventure, Virginia Beach is the place for family beach vacations! Surf's up! Virginia Beach has some of the best surfing spots on the Atlantic seaboard. 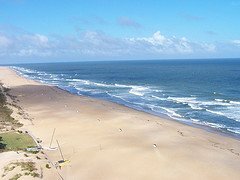 Click here for a link to the local weather forecast and the Virginia Beach surf cam. Not a beach lover? Need a beach-break? Vacations need more than just great beaches... and the Virginia Beach area has so much to choose from. History galore -- where else in the world can you wake up by the beach...and visit Colonial, Revolutionary, and Civil War America before bed? Want to hear our top picks for what to see at Colonial Williamsburg? (Plus how to see this attraction for free.) Or do you want to know why Jamestown attraction is best for you? Cruises -- from pirate cruises, to whale-watching cruises, to luxurious dinner cruises, to tours of the largest naval bases in the world...to cruises to Bermuda, it's your choice. Adventure fun -- play paintball in the Virginia Beach Splat Zone...free fall 130 feet from the Skycoaster...get wet and wild and Ocean Breeze Water Park...brave a world of caves, waterfalls and lost ships at Shipwreck Golf. Want Busch Gardens Discount Tickets and "inside" info? Click here. Maybe roller coasters at Paramount's Kings Dominion are more your speed? For full reviews of attractions in Virginia Beach, Williamsburg, Yorktown, Jamestown, and beyond, go to our Attractions page. Looking for cool beach gear, suntan lotion, a unique gift, or a quirky souvenir to remember your stay? The Virginia Beach area has enough choices to keep even die-hard shoppers satisfied. More of a mall-rat? Venture just a few miles from the beach and you'll find three malls to choose from: the upscale La Promenade Distinctive Shoppes, Red Mill Commons, and the Shops at Hilltop. Want some serious bargain-hunting to round out your family beach vacation? Just 60 minutes from the beach is Williamsburg, home to Prime Outlets at Williamsburg, Yankee Candle, and Williamsburg Pottery.